Just imagine the scene, there is a lovely soft breeze nudging your boat along the reservoir dam and you are occasionally connecting with some quality rainbows as you tease your team of flies back and up into that tantalizing hang position before recasting. What could possibly interfere to spoil your day? Maybe you are drifting some wild rocky Irish or Scottish shoreline searching for an Atlantic bar of silver, or a wild brownie that will call for a celebratory dram or three in the local, come nightfall. The big spoiler for many fly fishers is strengthening wind conditions that may take them outside their normal casting comfort zone. Any increase in wind speed makes it incrementally more difficult for us to fully straighten our fly lines behind our drifting boat and when we also factor in the long leaders that are often employed nowadays, then we can be in for some very interesting tangles! . All these frustrating tangles can spoil our day but worse still is sticking one or more flies into ones person. Fishing buddies often have a little chuckle when sharing anecdotes about the fly impailing boat partner from hell, secretly known as Vlad! , whose fishing technique takes a bit of a nose dive in efficiency anytime the wind gets up. It’s always good to have a laugh but we need to be fully aware that there is always the danger of errant flies penetrating exposed flesh or gods forbid an unprotected eye. The stronger the wind becomes the harder we have to work. 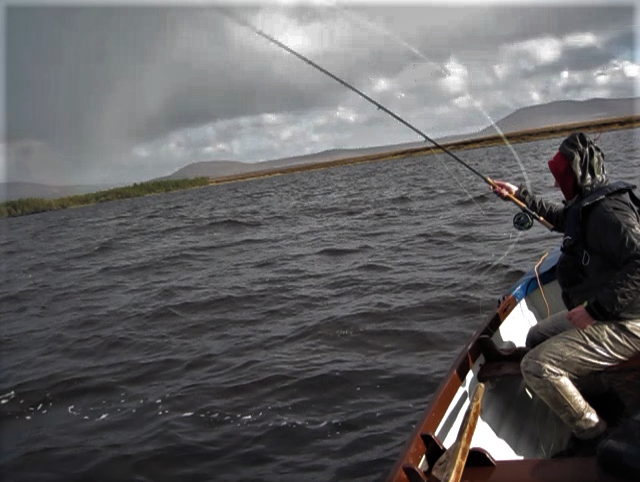 Even the resistance of the fly rod blank itself against a stronger wind will lead to extra physical strain not to mention the extra mental concentration needed to maintain the good technique that is required to straighten our line fully behind. As the wind increases in strength our margin for error reduces dramatically, and this will affect us all, to a lesser or greater degree depending on our experience. Thoughtfully readjusting our tackle and our fly casting technique will allow us all cope very well indeed with stronger winds and in fact if we get the right balance between tackle and technique we will actually use much less energy casting as the wind increases in strength. Before we delve into the strategies we can employ on windy days it might be helpful to have a very brief look back at how previous generations of anglers actually fished and how tackle and techniques have evolved to where they are today. 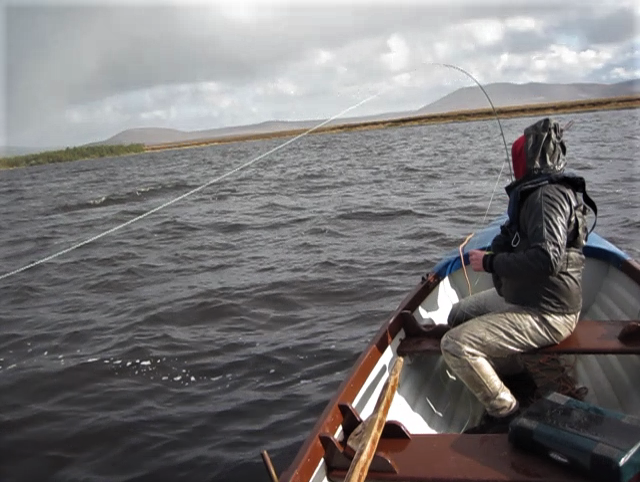 When I started traditional wet fly fishing on the Irish Loughs over forty five years ago there were many anglers still fishing the original short line style. The short line style simply meant that the angler just cast a relatively short length of level fly line and the retrieve was executed by raising the fly rod back up into the vertical position and recast. Skilled exponents would add wrist flickering and stuttering movements of the rod tip to make their flies come alive, but there was very little or no shooting or retrieving line. It was very noticeable that some of these fly fishers changed over to roll casting when it got windy. All through the 70’s and 80’s fly rods and fly lines were continually being improved and this accelerated the already growing movement towards casting ever longer distances, longer retrieves, different sinking lines, longer leaders, and a whole new array of techniques that became possible because of these advances in tackle. 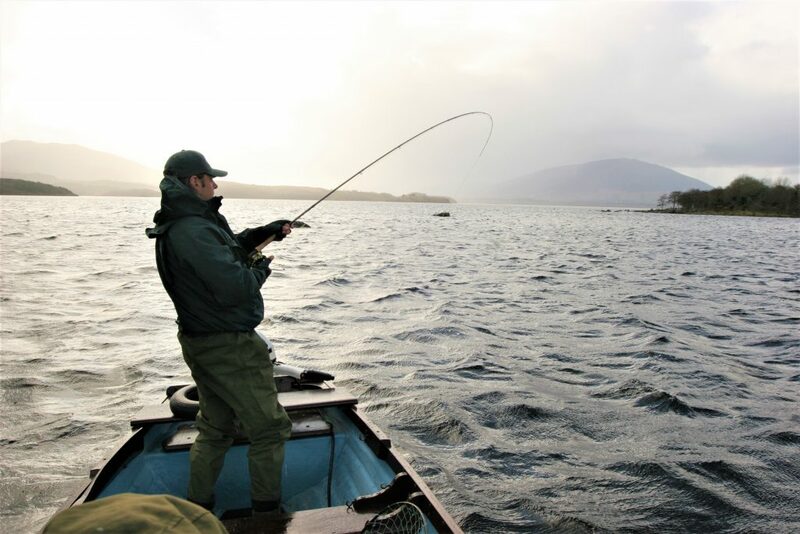 Compared to forty or fifty years ago we now have a bewildering array of techniques and different fly lines that are normally employed to be used at much further distances from the drifting boat . Long casting seems to be the norm and when you add in occasional testosterone fuelled competitiveness it can lead to fishing our flies at needlessly excessive distance’s where the actual hooking up on the takes we get, can then prove very difficult indeed. 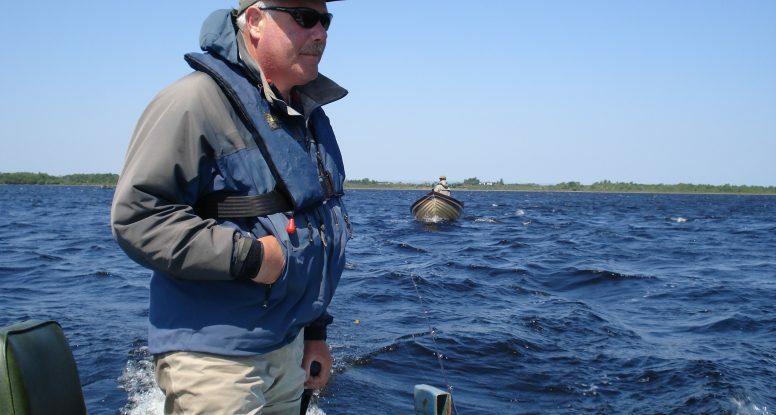 Why do you almost never see anglers using a basic roll cast anymore as their main delivery system when boat fishing? There are a few reasons for this. Firstly many of the longer heads on our modern weight forward fly lines when combined with long leaders will have an overall length that makes roll casting difficult because of all the extra water surface tension involved. Because longer fly line heads and leaders make roll casting more difficult, anglers do not believe that roll casting could possibly be an equally efficient and effective alternative to what they see everyone else doing which is always overhead casting. Most experienced fly casting instructors will tell you that the majority of their fly casting students will fail to have any real interest in practicing their basic roll casting technique but are very enthusiastic to practice normal overhead casting where achieving distance is easier and where they believe that they are making real progress. Is roll casting as equally effective and efficient as standard overhead casting? When we use our normal fly lines and leader set ups in calm or light breeze conditions , overhead casting is the most efficient and effective approach to take for many anglers. I believe good roll casting technique when allied to a well-balanced outfit that is designed to make roll casting easy is equally effective and efficient, and when the wind blows up stronger out on the reservoir or lake, roll casting is then by far the best option. Roll casting on a windy day allows you (if required?) to cast a long distance with absolute minimum effort and with the very important added bonus of never being in any danger from flies swishing past your ears. As the wind increases in strength it should become easier and easier to present our flies, not more difficult. Being able to comfortably cope and actually fully enjoy our fishing whenever the wind blows up a little really boils down to getting two main factors successfully sorted out. Number one is using a fly line that really suits roll casting and the second is sharpening up our roll casting technique so that it incorporates a smooth acceleration to a very crisp stop that is aimed in the correct direction. As a full time guide and fly casting instructor I have had the opportunity to cast with almost every decent rod and fly line that has come onto the market over the years. As Mr Eastwood might say, some were good, some bad, and some were ugly, but even though I might often have seen some advancements, these were gradual until I tested the Commando Heads from OPST. It takes something really special about a new product to get experienced fishing guides raving about it. For me and my guide friends it was the remarkable efficiency and amazingly versatile adaptability of these OPST lines that really caught our full attention. When clued in fishing guides come across fishing gear that is genuinely innovative and effective their first thoughts are how it will help their clients be more effective, and catch more fish. I initially tested these new Commando heads on a variety of small to medium size salmon rivers and they proved more than capable of handling every possible fishing scenario and performed equally well when used to spey, skagit, or overhead cast. I used them for pike fishing and again they were a revelation, making the fishing so enjoyable and easy. I just knew that they were also going to perform brilliantly out on the reservoirs and lakes, and so they did. 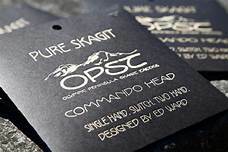 The OPST Commando is by far the best all round line I have ever used for Lough or reservoir fishing. Depending on line class, these heads are between 12 and 18 feet long and will comfortably cope with the addition of various sinking poly leaders up to 16 feet in length. The Commando line is a shooting head that can be attached to whatever running line the angler prefers. 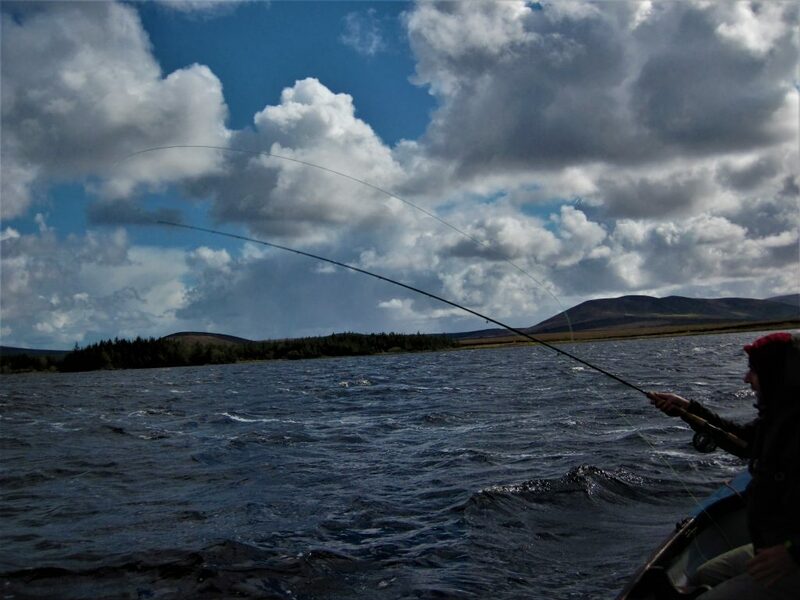 I would advise that when Lough or Reservoir fishing it might be best to use normal coated running line (pvc coated like a normal fly line) because lightweight mono running lines are too adversely affected by being blown around the boat by the wind. Don’t go for a running line that is too thin, running lines that are at the larger diameter end of the scale are easier to handle, easier to strip, easier on the stripping fingers, and slightly heavier which stops them being flapped around in a wind. Don’t believe advisors that tell you larger diameter running lines will adversely affect the distance you can cast. 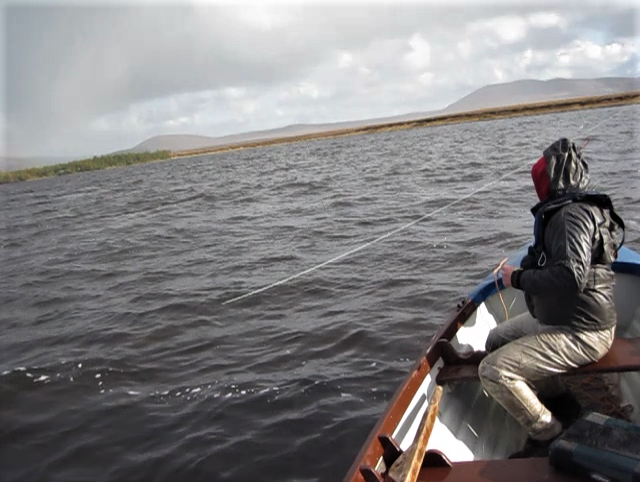 Remember we are not trying to break the world distance record at the CLA, we are equipping ourselves to fish really effortlessly and effectively while out on the Reservoir or Lough. Let’s have a look at some possible fishing scenarios. You are out on your favourite reservoir and after trying a few tactics you determine that a team of various nymphs and mini lures fished with a full floating line on a 20 ft+ leader is the best approach to adopt as you drift into a big shallow bay. You start to get a few takes and you are enjoying yourself. Gradually the wind starts to increase in strength and straightening your fly line fully on the back cast starts to become a struggle and you have already being tapped on your shoulder a few times by your flies as they whiz by you out of control. You brace yourself to physically put more effort into your back cast but all this is no longer feeling enjoyable. How can I cope and get back to effortlessly enjoying my day? Enter the Commando with its substantially shorter head length and its remarkable efficiency when roll casting. You can still continue to use your 20ft+ leader regardless of wind because you will now be roll casting. Regardless of wind strength just smoothly bring your rod up into the roll cast position and accelerate smoothly to a crisp stop and release. A few tips, aim your forward roll cast at a much higher angle than normal and by this I mean at least 60 degrees. The very last part of your forward roll cast just leading into the crisp stop should be a sword like stabbing motion because this will help combat over rotation of your wrist, and really help maintain the high trajectory that is required. If we execute our roll cast effectively then the Commando head will comfortably cast any leader or sinking poly leader that we could wish to employ. By the way, the roll casting tips outlined above will also help experienced anglers to roll cast more effectively with their normal weight forward fly lines, but using the Commando just makes it all so much easier. The photo sequence below shows good roll cast technique incorporating a forward delevery aimed high and a crisp stop. 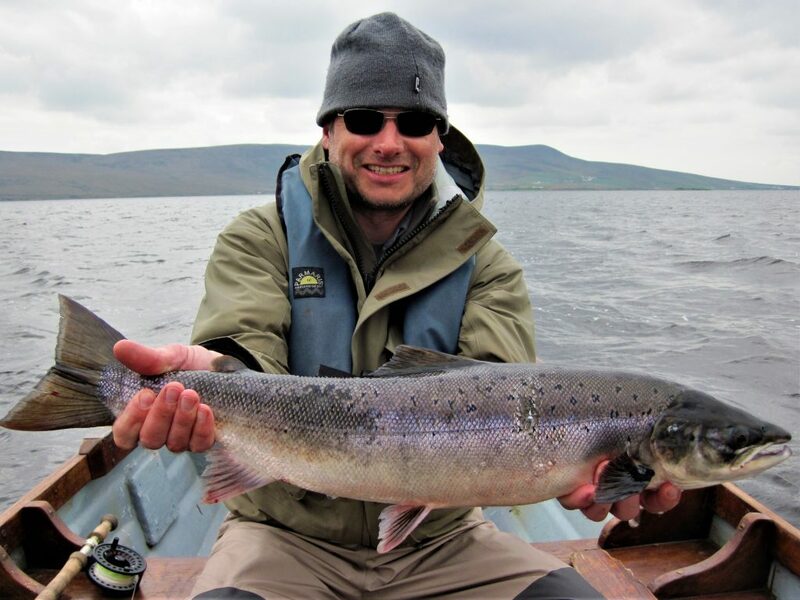 We might be enjoying our annual salmon or sea trout fishing holiday somewhere in Ireland or Scotland and find ourselves afloat casting traditional wet flies over rocky shallows. 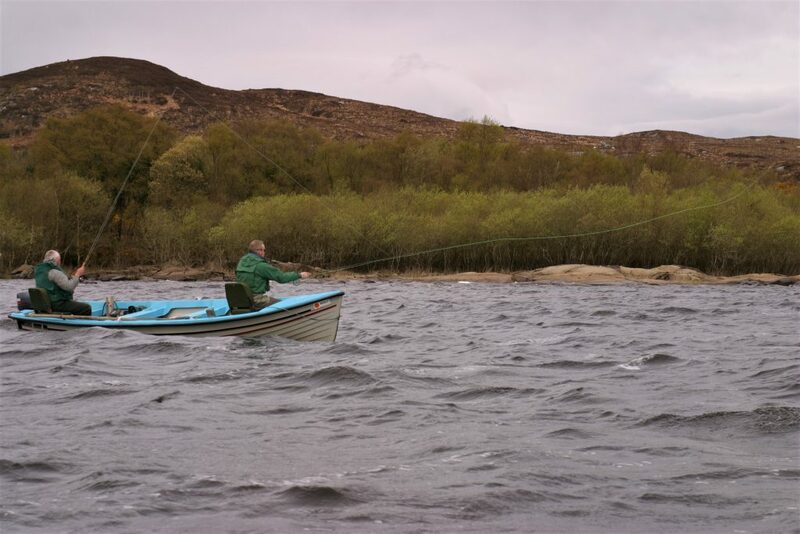 The ghillie or fishing guide might well have us using a fast intermediate or other faster sinking lines to search the rocky shorelines and all is well until a stronger wind starts to blow down the valley. Why not swop over to a Commando head and maybe a 14 ft fast or superfast poly leader while still retaining the same 12 ft mono leader and team of flies. Basic roll casting with our Commando head can start out with us just sweeping back and up to either shoulder to facilitate quite a respectable change of direction on the forward delivery if required. As we practice and gain confidence we can then start to experiment with little single or double spey casts to gives us even wider angle changes. We might even start to use casts like the Perry Poke, to help when fishing our flies really deep. All these different casts can be done in front or slightly to the side of our drifting boat without having to put our flies into the air behind us at all. We got Vlad a Commando line last season and now he is out fishing everyone! !